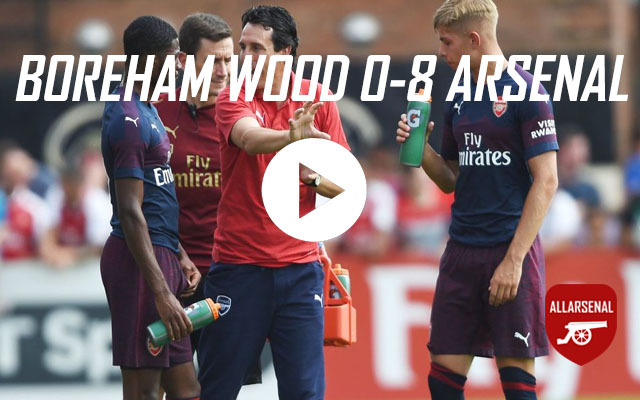 It was the first match of Unai Emery’s Arsenal as the Gunners kicked off their pre-season matches taking on Boreham Wood. It’s a familiar fixture for Arsenal in pre-season but things are very different this time around. Things started well for the Gunners. Pierre-Emerick Aubameyang continued his form from the last six months with a lightning fast start to the match. The Gabonese forward started on the left flank for the Gunners and easily curled a shot into the far top corner from that position inside the opening seven minutes. Ainsley Maitland-Niles wore number 15 for the first time of his career and he appeared to be enjoying the new responsibility. He burst down the right flank past two defenders and clipped a wonderful ball to the back post where Aubameyang was on hand to make it 2-0. It was the perfect start for Aubameyang and things got even better when Reiss Nelson went down in the penalty error and the referee pointed to the spot, allowing the former Borussia Dortmund man to step up and grab an 8-minute hat-trick. The Gunners a further two goals before the break as Reiss Nelson finely finished off a flowing Arsenal move before Alexandre Lacazette grabbed a goal of his own. Unai Emery made 11 changes at half-time as a whole new Arsenal side returned to the pitch. Things didn’t change too much, however, as the Gunners continued to push forward and grabbed the sixth goal through Eddie Nketiah. Jeff Reine-Adelaide struck a fine shot to make it seven before Eddie Nketiah flicked a wonderful pass through for Henrikh Mkhitaryan to make it 8-0.